if you’ve chosen to allow anyone on the web to visit your site, you’ll see an option to “Request public search engines not to index my site.” This option will not be selected by default, meaning that public search engines (like Google) will be able to index your site. 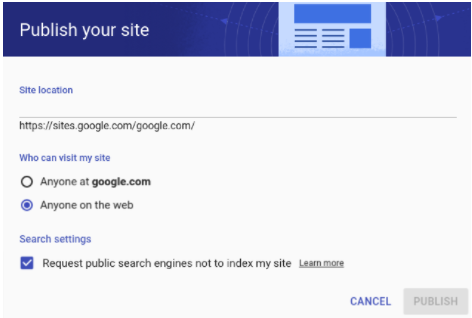 This option will be labeled as a “Search setting” to distinguish it from the enforced permissions above it—by checking it, you indicate only your preference that search engines not index your site. 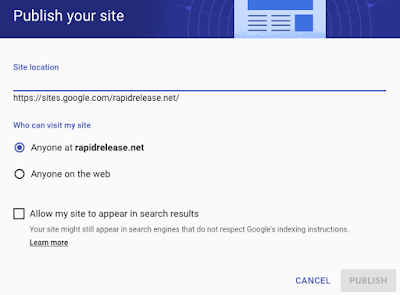 if you’ve chosen to restrict viewing of your site to your domain only, you will not see the “Request public search engines not to index my site” option, because no one outside of your domain will be able to visit your site anyway. Depending on your configuration, your site may appear in your organization’s internal search engine and on Google Cloud Search. Please note that today’s launch will not impact the settings of any already-published sites, unless they’re unpublished and republished. When you click “Publish” in the new Google Sites, you allow other people to view your site. If your organization allows you to publish sites on the web, you see options to (1) allow anyone at your domain or anyone on the web to visit your site, and (2) allow your site to appear in search results.